Thinking of Installing Garden Lights? We offer packages to supply and install the best quality LED outdoor lights for your garden! 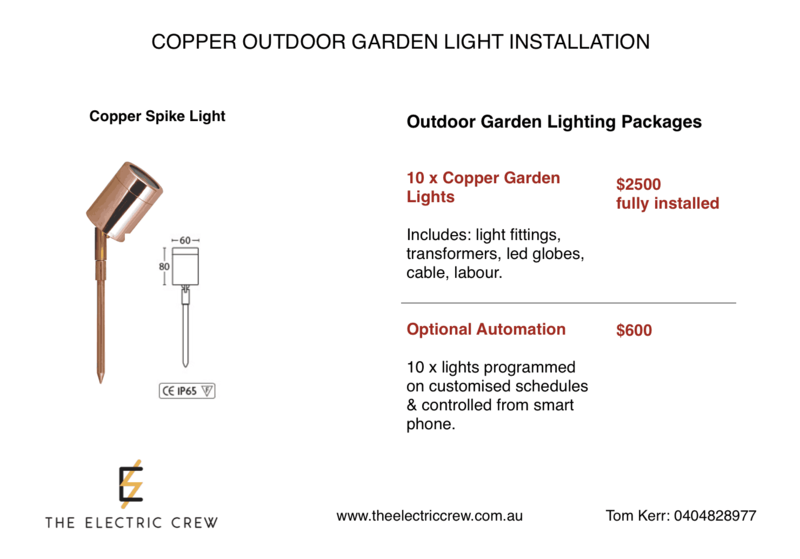 Our electricians are experienced in installing garden lights. We have tried and tested many outdoor lights on the market and have found these solid copper garden lights to be the best. Not only are they incredible quality and durable, they are also the best looking garden lights we have used. Combined with our high quality LED light globes, these spike lights direct vibrant light onto trees, shrubs, and other garden features. Package contents: Please download our brochure by clicking the image on your left. See our Projects page for examples of our Outdoor Garden Lighting Design and Installation Projects. Want to control your outdoor lights from your phone? During your free consultation, we can discuss the option of fully automating your garden lights. With Nero Smart Home Automation you can switch your lights on and off using your phone. Not only do you have manual control, you can also create customised schedules so that your lights turn on and off automatically. Automation of 10 x outdoor garden lights for $600. Why would you want to automate you outdoor lights? In our experience, clients like the idea of being able to control their lights from their phone inside the home or even remotely. Depending on your garden, your outdoor light switches could be inconveniently located, which creates an extra hurdle to turning your outdoor lights on and off. Automated Outdoor Lights also turn on and off while you’re on holidays – a great addition to your home security.